Assembly Bill 680, introduced by Assemblyman Kansen Chu (D-San Jose) and sponsored by NAMI California, would allow emergency dispatchers to receive the same mental health crisis training as police officers. “This legislation gives dispatchers the tools they need to facilitate the safety and efficiency of these encounters by summoning the right people, providing the most accurate information to those called and protecting us as citizens as well as the brave first responders who arrive to provide assistance,” NAMI California CEO Jessica Cruz said in a statement. “NAMI California envisions a future in which all interactions between first responders and those in a mental health crisis be safe, healing and accommodating. Existing laws already require specified categories of law enforcement to meet training standards pursuant to courses of training certified by the Commission on Peace Officer Standards and Training. They currently have to undergo 15 hours of behavioral health and de-escalation training, with additional continuing education courses. Chu says the bill would help dispatchers better recognize mental health issues, disabilities or substance abuse disorders when encountering emergency situations. It would also help them enhance communication and improve de-escalation outcomes in crisis situations. Chu added that the trainings would help keep individuals living with a mental illness out of jail and ensure they receive the proper treatment. "We need to do better to connect people with the appropriate services," he said. On Monday, October 29th 2018, 51 NAMI members throughout Los Angeles County from 10 affiliates gathered for the San Fernando Valley Regional Advocacy Meeting. 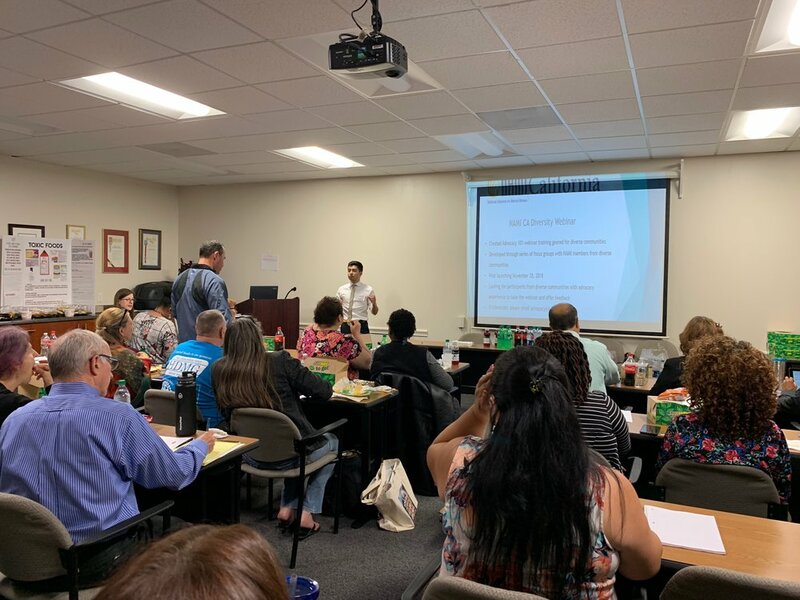 NAMI California, in collaboration with NAMI San Fernando Valley and NAMI Los Angeles County Council, coordinated the San Fernando Valley Regional Advocacy Meeting to provide members the opportunity to discuss priority issues in Los Angeles County. Regional Advocacy Meetings are designed to bring together members of the public, family members, community-based organizations, program leaders, and local NAMI affiliates to discuss priority issues. A big part of these meetings is working with Department of Mental Health staff to discuss the public planning and share ways members engage with that process. From left to right: Deanna Robinson - Moderator, Brittney Weissman - Moderator, Dennis Murata - Service Area 8, Theion Perkins - Service Area 1, Lisa Wong - Service Area 3, La Tina Jackson - Service Area 2, Jacquelyn Wilcoxen - Service Area 5. 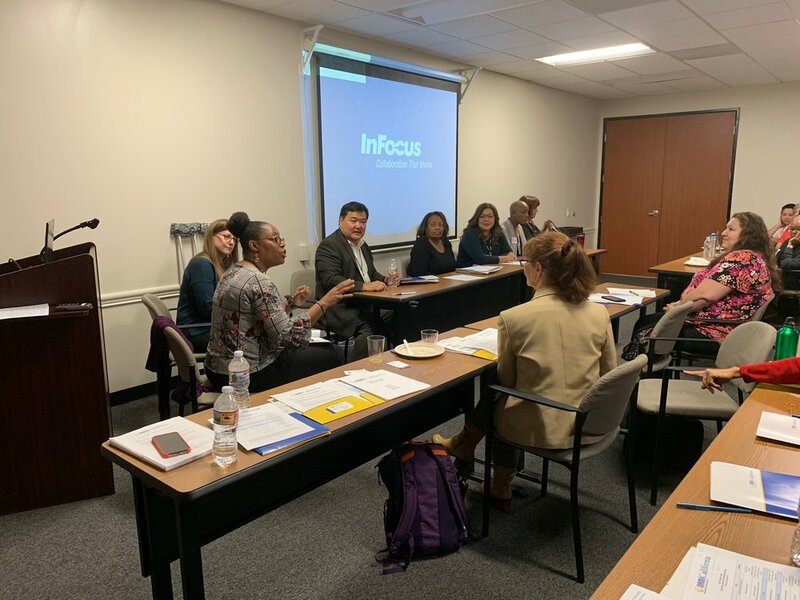 After a passionate and engaging panel discussion with the Service Area Chiefs, NAMI members took part in the NAMI Smarts training hosted by Deanna Robinson, NAMI San Fernando Valley Executive Director, and Jean Harris, NAMI Antelope Valley. NAMI Smarts is a training developed to train NAMI members on how to engage policy makers in our priority issues. NAMI Smarts modules teach members how share their story with legislators, give an elevator speech, write letters of support/opposition, and other avenues of advocacy. After having an opportunity to learn advocacy skills, members had a chance to break into groups and discuss local priority issues to move forward with in Los Angeles County. Our members discussed various needs in their communities ranging from the housing crisis to criminal justice reform. This meeting will be the first in a series of advocacy discussions in Los Angeles. Thank you to Deanna Robinson, Susan Levi, and Brittney Weissman for their coordination of this successful event.